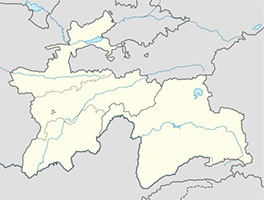 Tajikistan lays on the south-east part of Central Asia. Mountain relief dominates. Fergana Valley is situated on the north, on the northwest and in central regions -Turkestan, Zarafshanm Gyssar and Alay mountain ranges. High mountain Pamir system stretches across southeast. The territory covers 700 kms from west to east and 350 kms -from north to the south. On west and north Tajikistan borders on Uzbekistan and Kyrgyzstan, on the south and east- with China and Afghanistan. It’s distinctly continental, temperature range – from -20°C in January to +30°C in June depending on the elevation. Basic economy sectors are light industry (ginning, cotton industry and carpet weaving) and non-ferrous metallurgy (production of aluminum, mining and dressing of ores of non-ferrous metals). Cotton growing, silk production and fruit growing; in mountain regions it is grain growing and livestock breeding (sheep breeding and horse breeding). Cultivation of technical crops like flux, sesame, geranium and tobacco, fodder and cereals is well developed. Ethnic groups: Tajiks (84.26%), Uzbeks (13.94%), Kyrgyz (0.80%), Russian (0.46%), Turkmen (0.20%), Tatars (0.09%), Arabs ( 0.06%), Pashtuns (Afghans) (0.05%), Roma (0.03%), Turks (0.02%), Ukrainians (0.01%) and others.